Beauty will be literally on the doorstep for Lancashire residents thanks to a Bolton business woman. 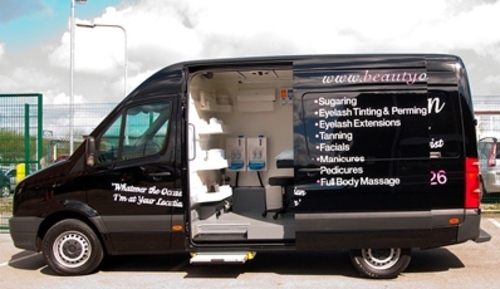 Jackie Naylor, owner of beauty business, ‘Beauty On Wheels' has upsized her business by converting a Volkswagen Crafter van into a mobile beauty salon. The 34-year old beautician previously transported all her equipment, massage bed and products in a Volkswagen Golf but due to growing business demand, space became an issue. Lancashire Volkswagen Van Centre helped the beauty entrepreneur find a solution by converting Volkswagen’s largest van, the Crafter, into a self-contained luxury treatment room. Her move to purchase Volkswagen Commercials largest vehicle has seen the entire inside converted into a beauty parlour. The pimped and preened Crafter van offers customers a private treatment room on wheels, complete with massage bed, hot and cold running water, heating, power points and lighting. Jackie said: “Making the move to a commercial vehicle was a big step but as my business is growing and I’m offering a wider range of treatments, a Crafter was the perfect solution." “Customers can now enjoy all the benefits and privacy of visiting a salon with only going a few steps from their home." Notes to editors: For more information, please contact John Rawlings, Press and Public Relations Manager, Volkswagen Commercial Vehicles on 01908 601478, 07872 379544 or john.rawlings@vwcv.co.uk. This press release was distributed by ResponseSource Press Release Wire on behalf of Volkswagen Commercial Vehicles in the following categories: Women's Interest & Beauty, Motoring, for more information visit https://pressreleasewire.responsesource.com/about.